The Republic of Korea Navy (RoKN) has taken delivery of its first Daegu-class (FFX-II) frigate. 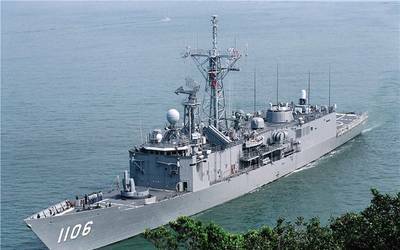 South Korea’s defense procurement agency, Defense Acquisition Program Administration (DAPA) formally handed over the ship to the Navy, the first of an eight-ship program. As well as the controllable pitch propellers, Rolls-Royce is on contract to provide the main propulsion power for the first four FFX-II ships with the Rolls-Royce MT30 gas turbine as part of a hybrid propulsion system, specifically designed to enhance Anti-Submarine Warfare capabilities. Eight Daegu-class frigates are scheduled to be built, the first of which is being built by Daewoo Shipbuilding and Marine Engineering (DSME). The second ship will also be built by DSME, while ships three and four will be built by Hyundai Heavy Industries (HHI) SNSD. The MT30 gas turbines for ships two, three and four are due to for delivery in the second half of this year. Rolls-Royce MT30s are in service with the U.S. Navy’s Freedom class Littoral Combat Ship and already powering the Zumwalt class. This fourth generation gas turbine has been selected in single gas turbine CODLOG (Combined Diesel Electric Or Gas) configuration for the Daegu Class and the Royal Navy’s Type 26 Global Combat Ship. It is also powering the Royal Navy’s new Aircraft Carriers, with sea trials nearing completion on HMS Queen Elizabeth, with two MT30 gas turbine alternators per ship. Rolls-Royce is also supplying four MTU 12V 4000 M53B engines per FFX-II vessel. The MTU gensets for the second FFX-II vessel will be delivered later this year. The engines have a mechanical output of 1,650 kW each. As an integral part of the CODLOG propulsion system, the purpose of the gensets is to provide both the electric power for the electric propulsion (E-motor) as well as the electric power to the switchboard for the vessel’s electrical load (onboard power). The MTU engines are delivered in partially knocked-down (PKD) condition to STX who locally assemble them in South Korea.